The Peace & Justice Centre and the Conscientious Objectors Memorial Committee are pleased to announce the Design Competition for a permanent Memorial to Conscientious Objectors – and all those who oppose wars, in all times and places – to be created in Edinburgh’s Princes St Gardens. View and Download the Brief Here. Following approval of our petition for a memorial to conscientious objectors the City of Edinburgh has committed to work with us to find a suitable location for the memorial. Our proposal for a site in Edinburgh’s Princes St Gardens will be considered for approval when we submit a design. We aim to install the Memorial by April 2019, the centenary of the end of the First World War for COs who were released from prison in April 1919. A World Heritage site visited by millions of people, Princes St Gardens is home to numerous war memorials and adjacent to Edinburgh Castle and the National War Memorial. Located in the midst of eight memorials to those who fought and died in many wars, the CO Memorial will dramatically raise awareness of resistance to war and of the often overlooked fact that Britain was the first country to establish in law a right to conscientious objection to military service, a right that has since been recognised by all but one European country and the United Nations. 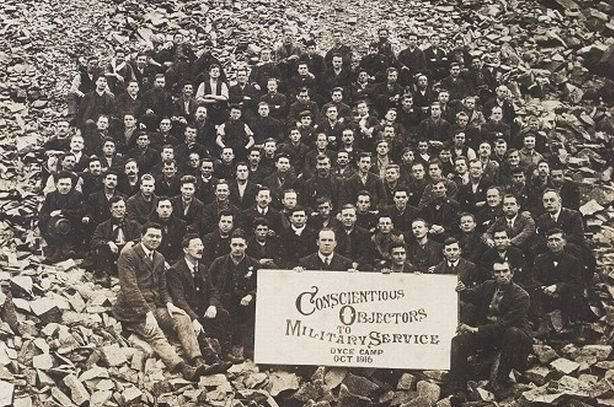 Opposition to the First World War and conscientious objection to conscription was a notable part of the social history across Britain, especially in Scotland, being rooted in social and political movements such as socialism, communism and nonconformist religious communities such as Quakers. The Memorial will be as a space for public reflection on the moral implications of warfare and suggest that there is a better way, through peacebuilding and conflict resolution. It will be an enduring locus of reflection on the important role of those who resist dominant norms even in the face of ostracism, vilification and personal hardship. Such people have often led the way to changes in attitudes and social, political and cultural practices that are later recognised and accepted by the mainstream of society. The Memorial will assert the essential value of dissent, inviting reflection on the traditions of liberty, humanism, and internationalism that have shaped political and cultural norms central to democracy such as tolerance and diversity. Across the UK there are thousands of war memorials, . Yet the fact that tens of thousands of British men and women have refused compulsory service is largely invisible. By virtue of its location in proximity to these prominent national war monuments, a memorial to COs will represent a respectful counterpoint, suggesting that there is another way to resolve conflicts than through war.